SANTA CLARA, California, April 17, 2018 /PRNewswire/ -- Based on its recent analysis of the contact center industry, Frost & Sullivan recognizes Genesys with the 2018 North American Company of the Year Award for its leadership in the industry. The company offers a robust portfolio of omnichannel customer experience and contact center solutions, optimized for a changing workforce and modern consumer base. It includes enhanced Workforce Optimization (WFO), and artificial intelligence (AI) -powered solutions, such as bots, virtual assistants, and analytics-driven routing and intelligent workflows that help businesses truly differentiate the customer experiences they provide. 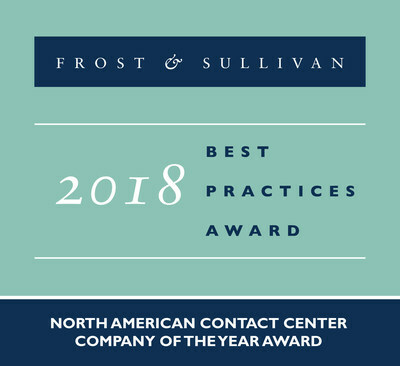 Download the 2018 Frost & Sullivan North American Contact Center Company of the Year Award. "Genesys offers one of the broadest customer experience portfolios in the industry, with solutions that help businesses achieve specific outcomes, such as revenue increases, cost savings, or improved customer satisfaction," said Nancy Jamison, Principal Analyst, ICT. The company has maintained a leadership position within the customer contact center industry for years by evolving its Customer Experience Platform, including the Genesys PureCloud®, PureConnect™ and PureEngage™ offers, through ongoing investment in research and development. As a result, Genesys stays ahead of the curve on emerging trends and ever-evolving consumer preferences. Over the years, the Genesys brand has grown through a series of strategic acquisitions, which has broadened the company's portfolio to cover the entire market while enriching its cloud offerings. In the past two years, the company has undergone a complete corporate rebranding and restructuring across the organization, from how it develops and delivers products to its sales and professional services. Genesys offers a broad range of contact center tools, AI and machine learning technologies, and applications that enable customers to address unmet needs and implement effective strategies ahead of competitors. The company's Blended AI strategy, which combines bots with the human touch to solve customer problems faster, is an example of the innovative approach Genesys is taking to infuse AI into customer care. To provide its customers with continuous value and to give businesses the level of interaction they want from Genesys, the company launched PureSuccess. The program provides varying degrees of assistance through full-journey, fit-for-purpose sets of services elements relevant to Genesys customers throughout their entire lifecycle. To assist customers with their migration from legacy competitive platforms to the next-generation Genesys Customer Experience Platform, the company introduced its PureBridge program in 2016. As part of its cloud-first strategy, the company shifted to providing a subscription-based consumption model as an alternative to perpetual licenses, providing clients with flexibility for fluctuating capacity needs and channel usage. "Through its portfolio of contact center offers, Genesys provides its clients with advanced solutions to engage with customers via new interaction channels and applications, using innovative, sophisticated tools," said Ms. Jamison. "Frost & Sullivan recognizes Genesys as Company of the Year in the contact center industry due to its robust customer care portfolio and long-standing customer commitment." Each year, Frost & Sullivan presents a Company of the Year award to the organization that demonstrates excellence in terms of growth strategy and implementation in its field. The award recognizes a high degree of innovation with products and technologies, and the resulting leadership in terms of customer value and market penetration. Genesys® powers more than 25 billion of the world's best customer experiences each year. Our success comes from connecting employee and customer conversations on any channel, every day. Over 10,000 companies in more than 100 countries trust our #1 customer experience platform to drive great business outcomes and create lasting relationships. Combining the best of technology and human ingenuity, we build solutions that mirror natural communication and work the way you think. Our industry-leading solutions foster true omnichannel engagement because they perform equally well across channels, on-premises and in the cloud. Experience communication as it should be: fluid, instinctive and profoundly empowering. Visit genesys.com on Twitter, Facebook, YouTube, LinkedIn and the Genesys blog. For over five decades, Frost & Sullivan has become world-renowned for its role in helping investors, corporate leaders and governments navigate economic changes and identify disruptive technologies, Mega Trends, new business models, and companies to action, resulting in a continuous flow of growth opportunities to drive future success. Contact us: Start the discussion.